Geon Secure Execution Processor delivers secure code execution by supporting two secure contexts. All code and data belonging to a secure context is cryptographically isolated in main memory, so even complete software breach outside of secure context doen not compromise its security (confidentiality or integrity). Cryptographic operations can be performed with single Keccak (SHA3) core or by combination of cryptographic hash primitives (SHA3 or SHA2) and symmetric ciphers. Despite upgrades allowing for secure execution processing, the Geon processor maintains high configurability, performance and efficiency of the proven BA22. Performance is remaining in-line with BA22-CE. The processor is already verified at system level and suitable for diverse security needs. Instruction Set Architecture (ISA) together with processor architecture defines a software view of processor family as seen by programmer. It has prevailing impact on several key processor characteristics, including code density and ease of software development. The BA2x ISA was designed from ground up with design goal achieving highest code density among 32-bit processors with no compromise on performance. To achieve such ambitious goal it was necessary to rethink how ISA is designed. Often instruction set is defined with legacy constraints and by processor architects who are coming from hardware background. We have instead dropped all legacy constraints and first developed a fully working and optimized compiler for initial ISA proposal. This allowed us to do conclusive benchmarking on vast code base, comparing results with other architectures and finding new, better solutions. Ultimately, ISA design is an optimization problem. Iterating through numerous approaches, ideas, optimizations and also dead ends we finally settled on BA2x ISA that is (based on our benchmarks) best fulfilling our design goal of highest code density at no compromise on performance. The resulting BA2x ISA has 32 general purpose registers, all addressable with all register operand instructions. It also features cleverly encoded 16-bit, 24-bit, 32-bit and 48-bit instructions for maximum code density with simple decoding. The smaller the processor, the more ISA matters. Best example of BA2x ISA is Beyond BA20 PipelineZero processor, capable of outstanding performance per MHz at extremely small area and ultra-low power consumption. Often better code density than with legacy 8-bit and 16-bit processors, like 8051 and 80251. Smaller memories burn less power, especially important when on-die memories often consume more power than processor itself. In case of embedded processors, memories are usually bigger than processor core itself. Code density is achieved by reducing instruction count instead of reducing the average instruction size. Programming in assembly is usually not required. When it is, instructions take 32-bit immediates, and assembler automatically selects shortest one unless specifically instructed otherwise. Instructions have no strange side effects. All instructions with register operands can address any of 32 general purpose registers. Code compiled into BA2x ISA usually results in 10% - 40% smaller static instruction count than competing architectures. BeyondStudio integrates the development tools for any BA2x processor into a single platform based on the Eclipse open development environment. It offers easy access to the compilation and debugging tools which are essential in modern software development. Great source code editor with syntax highlighting, customizable code style, code cross-referencing, etc. Custom tools and plug-in components allowing for easy deployement of binary to simulator or hardware targets. 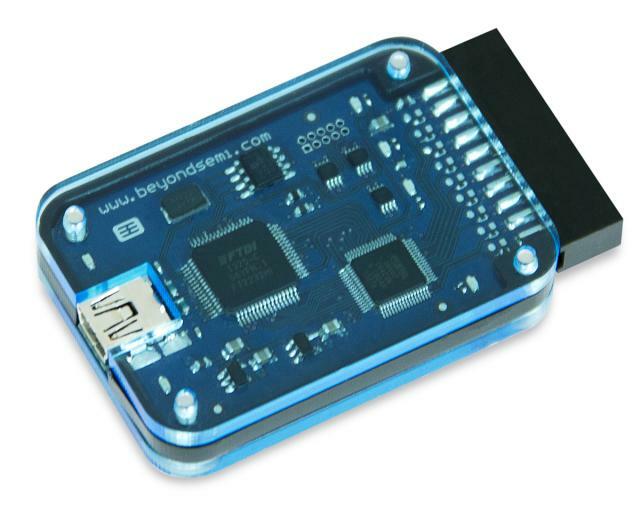 Beyond Debug Key is an essential tool for embedded software development, enabling access to processor debug features through JTAG interface and simultaneous connection to UART serial console. Featuring USB 2.0 connection to PC and wide target IO voltage range it is a compact debug and diagnostics tool. Beyond Debug Hub is fully compatible with Beyond BA2xTM processor family as well as majority of other processors. In addition to IEEE 1149.1 and IEEE 1149.7 standard JTAG signal set it also supports proprietary One Wire Debug and Two Wire Debug protocols. With appropriate software it can be used to perform various IC level and board level diagnostics.